I'm reading every Aquaman solo adventure in publication order, one per day. After I read each story I'm going to post the cover/splash page and a few thoughts on the story. Want to read these stories yourself? 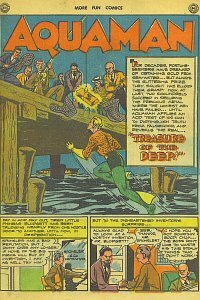 Write to DC: Dan Didio, Executive Editor, DC Comics, 1700 Broadway, New York NY 10019 and ask for a reprint of Aquaman's Golden Age tales. Phineas Blodgett believes he has invented a way to extract gold from sea-water, but his financers have other plans in mind. No one believes in Blodgett's invention, not even Aquaman, but it does work in a fashion in the end... Baldy is completely confused as to why his boss is helping the daft little inventor, which goes to show how slow on the uptake he is... Aquaman thinks he's capturing criminals stealing gold from the factory, but the movement was the other way... Blodgett creatively names his company "Blodgett Gold-From-Sea-Water Enterprises Inc.", which allows Aquaman to figure out what the factory is for right away... Baldy is happy to see Aquaman working for him and his boss in recovering gold bars from the ocean floor... To escape the steel vault, Aquaman releases acid onto the floor so it falls away. It makes one wonder just what the vault was for. Finny Friends Report: Aquaman gets no assistance from finny folks in this story, although he does apologize for bothering them at one point. Captured/Knocked Out report: Aquaman is locked in a steel vault when he goes in to rescue Blodgett. Quotefile: Blodgett: "But, Aquaman... y-you're letting out some of the most dangerous acids! If we should fall..." Aquaman: "Just don't fall, that's all!"